يفضل أن تضع لنا ضورة توضح رسالة الخطأ حتى نصل للحل بسهولة. 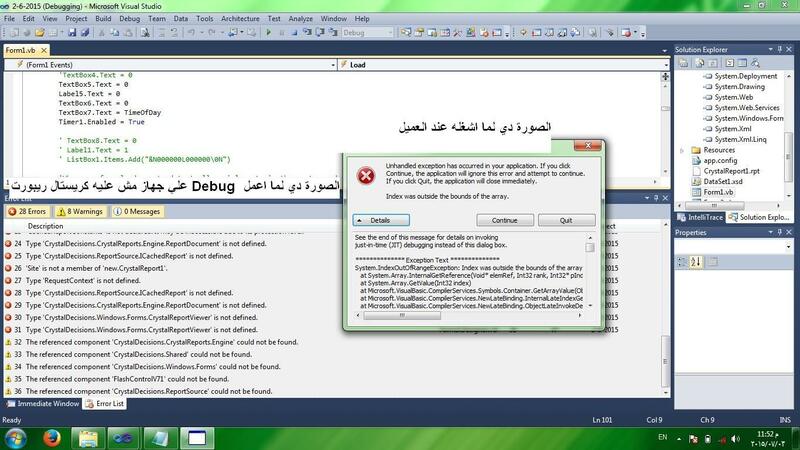 Warning	32	The referenced component 'CrystalDecisions.CrystalReports.Engine' could not be found. Warning	33	The referenced component 'CrystalDecisions.Shared' could not be found. Warning	34	The referenced component 'CrystalDecisions.Windows.Forms' could not be found. Warning	35	The referenced component 'FlashControlV71' could not be found. Warning	36	The referenced component 'CrystalDecisions.ReportSource' could not be found.